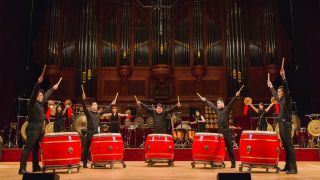 A night of stunning virtuoso drumming and powerful, pioneering percussion is coming to London's Barbican Theatre this October as the Ju Percussion Group heads into town. Fans of percussion-heavy theatre such as Stomp and the Blue Man Group will not want to miss this evening of stick work and musicianship at its finest. The show, which takes place on 5 October, is the first time this incredible collective has performed in the UK and forms part of the group's 30th anniversary tour. The show itself sees 20 musicians interweaving complex rhythms and patterns played out on gongs, drums, marimbas and all manner of exotic percussion instruments. Musically and stylistically, the group fuses East with West thanks to a show that brings traditional Asian rhythms together with modern pop beats. In this respect the audience is treated to the best of both words as the show boldly mixes traditional and contemporary music to sublime effect. The end result is a jaw-dropping and thrillingly staged production packed with rich choreography and thundering beats. Put simply, Ju Percussion Group provide an absolute feast for the senses. Ju Tzong-Ching is the genius behind the group. He formed the ensemble way back in January 1986. Since then, they have put on more than 2,500 performances, wowing audiences worldwide with their sublime musicality and showmanship. This is a show that you certainly do not want to miss when it comes to the iconic Barbican Theatre in London on 5 October. The show starts at 7.30PM. For more details and ticketing information call the Barbican box office on 020 7638 8891 or visit www.barbican.org.uk.